Celebrating the Choice of Champions! This Paramount Air 75th is dubbed the “Swiss Miss”. If you’ve been following our Facebook page, you’ve seen that this bike has been on the road in Switzerland (which didn’t have quite the winter we had). This masterpiece, for Jeff in the Chicago area, features one of the most popular colors in Waterford history, Blue Flame, itself a variation on Schwinn’s famous Sky Blue of the 1960′s. 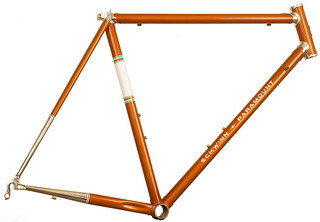 This Paramount Air/Stainless shows off Waterford’s take on Schwinn’s Radiant Coppertone, one of the coolest stylings of Paramount’s first golden era. Also, note the stay tip masking. Black is indeed beautiful and never out of style, as shown here with Joe W’s stealth frame. Happy to report the stealthy black bike is in the workstand for assembly! Just in time for Spring to break. I assume that they’re spoken for. 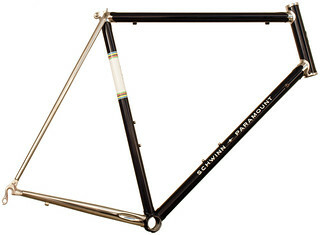 Has anyone ordered a Coppertone with fully chromed stays? 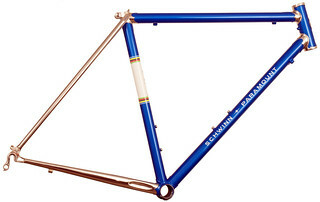 On my screen the Blue Flame frame actually looks closer to Schwinn’s Radiant Blue than to the Sky Blue. There are two in Coppertone.. It’s only natural that Coppertone enthusiasts would want the masked stay tips. I have to figure out a way to justify that Radiant Coppertone! 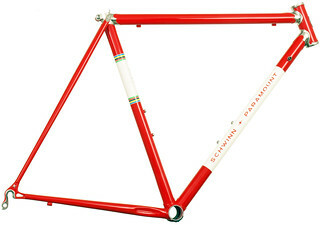 Talk about my dream bicycle! What dilemmas! I thought about Coopertone and then Candy red. I settled on Metallic Orange. I rode it for the first time yesterday. What a beautiful bike! Thanks to the Waterford crew!